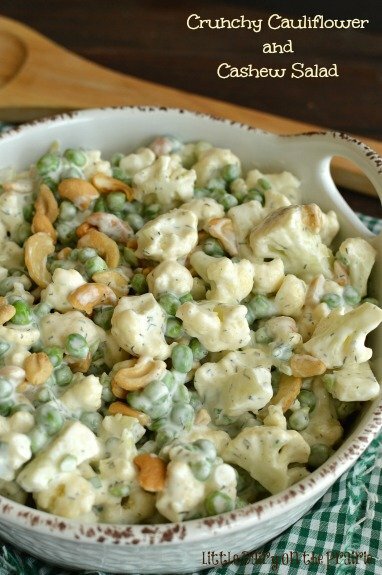 Crunchy Cauliflower and Cashew Salad happens to be one of my favorite salads, especially in the spring! It’s fresh, creamy, crunchy, salty, and even healthy! 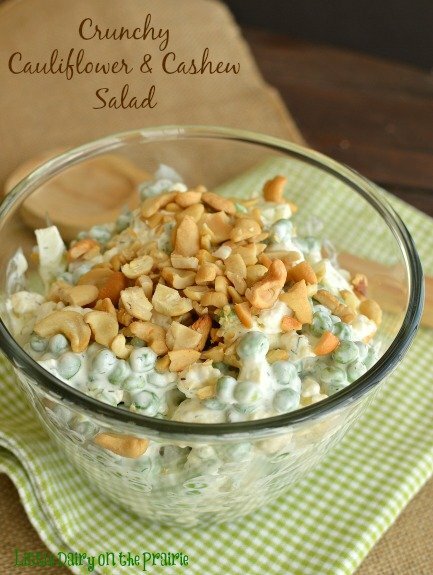 I saw a recipe similar to this Crunchy Cauliflower and Cashew Salad years ago. I knew right away I would love it! I also knew right away my family would not love it. My boys are not shy about proclaiming their dislike for onions, especially green ones, and dill. I LOVE green onions and dill! This recipe had the potential of tricking them into eating both green onions and dill and getting them to like it! After all, boys will eat anything tossed in ranch dressing! 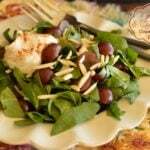 I had been dying to try making this salad in a healthier version. The other day I made it and it was superb! Three of my four boys ate it and they liked it! That means this Crunchy Cauliflower and Cashew Salad rocks! I think it is perfect for Easter dinner, barbecues or potlucks! It always goes fast! It’s a good thing too, because this salad doesn’t keep very long. In fact don’t stir the cashew in, or sprinkle them on top until just before you serve the salad. Otherwise they loose their crunch! I love the textures as much as the flavors in this fresh salad. 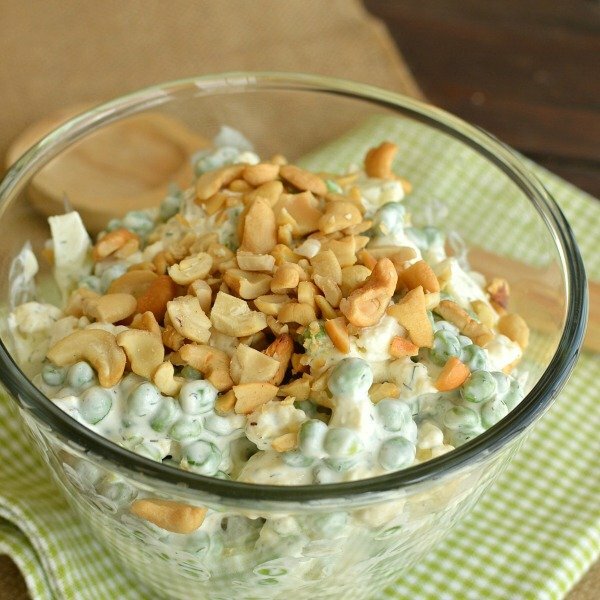 It's crunchy, salty, creamy and even a little bit healthy! In a small mixing bowl mix together yogurt, sour cream, ranch seasoning, dill, salt and pepper. Thin with a little milk if it looks to thick. You want it a little thinner than the consistency of sour cream. 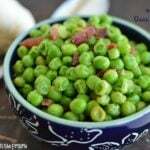 Add peas, cauliflower, onions and cheese (if desired) to a large mixing bowl. Toss. Pour yogurt mixture over veggies and toss to coat. Adjust seasonings with salt and pepper. Cover and chill for an hour. Just before serving sprinkle with cashews. May toss the cashew in with the veggies if desired. Who ever thought cauliflower could look so good! I love pretty salads with lots of textures! This salad definitely has all of that! 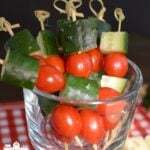 This looks like a great party salad! Cauliflower is such an overlooked and unappreciated vegetable!!! This looks wonderful! Thanks! I’m really the only one in my family who loves cauliflower, but after dressing it up a little they devoured it! What a delicious sounding recipe. I’m pinning this and will try it asap! If you have a minute to spare I’d be thrilled if you could share your idea at my weekly Say G’Day Linky Party. It’s on now and this would be a fantastic addition. I am ready for all fresh food! That’s what warm weather does for me! Thanks for the invite to your party! An awesome combination of color and texture. Maybe you could try growing cauliflower in your garden this year, or have you already done that in the past? Yum this is making my mouth water. I love the mix of texture with the crunchy peanuts and veggies. Pinned. Sounds and looks delicious, thank you for sharing! Just curious why you chose to use both sour cream and Greek yogurt, couldn’t one just use all Greek yogurt? Is it due to consistently, texture, or flavor? 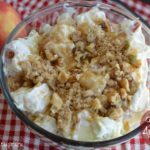 I love Greek yogurt because it is so much healthier than eating sour cream or mayo. Since it has a little different flavor than sour cream I usually mix them together. I’m sure it would be fine to use only Greek yogurt though! Whoa…3T is way too much ranch. It killed the salad. eF! I guess I’m a ranch lover! Of course, you can always adjust seasonings to taste! Great salad – did not have cashews or Swiss cheese, so I used walnuts & cheddar cheese. Even with these substitutions it was still yummy. I love substituting ingredients! It’s always fun to try the same old recipe in a new way! Glad it was so yummy! I wondered about cooking the cauliflower just a little, until al dente. It seems like that might soak up the sauce a little more. Has anyone tried that? That’s a great idea! I bet it would work perfectly! Let me know how it goes!